I’ve been a very good girl this week. I’ve kept being decarbohydrated and I’ve managed to tie one more Oliver Edwards. It’s a Klinkhammer Extreme. My version looks rather dull and run of the mill but thinking about it, how extreme can a fly be? It’s hardly going to stage a fascist rally or dissolve into anarchy. Perhaps if my wing post were bright pink like Oliver Edward’s it would help. Still, it’s about as radical as a Surrey teenager piercing their navel. Fly Dressers Guild was brilliant this week. 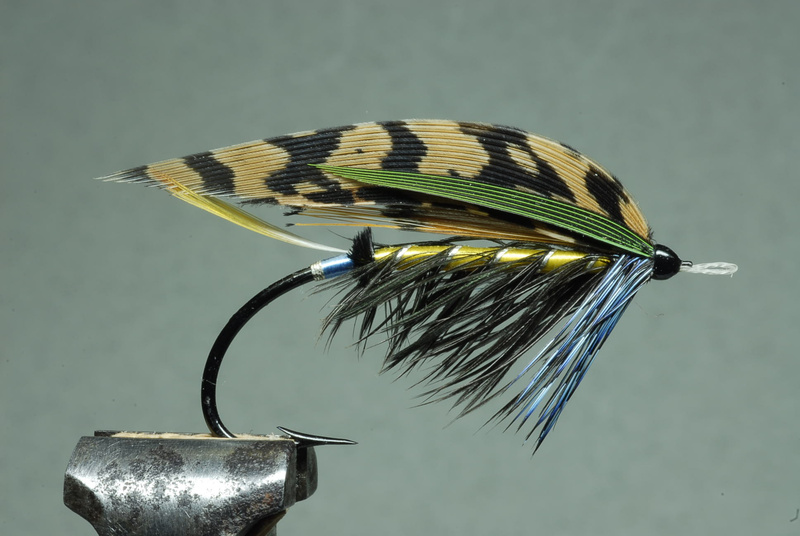 Fourteen of us have made a start on tying a classic style married wing salmon fly. If you don’t know what one is I recommend you look at anything tied by Paul Little. Apparently he takes nearly a day to tie a fly. I believe it. It took me two hours to do the body. I am quite pleased with my rear end, though the front is rather less convincing.Tying these flies demand perfection and exacting standards. To avoid fraying the silk floss, hulking men from Yorkshire will wear small and slinky silk gloves when they tie these flies. How extremely ridiculous. I went fishing this Saturday at the small Stillwater Kilnsey Park. The temperature stayed at nought or there abouts. The day was peppered by blizzards and a howling gale was ever present. My hat blew off, my line blew everywhere, my rod blew away. It was quite inclement and I was only kept warm/alive when I was lent a very swanky jacket with particularly good, deep pockets. It was a Grey’s GRXI XTREME. I also learnt a thing or two about fishing still waters which, as a child of the chalk I can be quite snobby about. The men I fished with were highly dedicated and focussed. It takes a certain amount of bloody mindedness to fish solely for size or number. On that kind of water, pleasurable angling becomes sport fishing. For me the difference between the insouciant, languid river fishing I like to do and the extreme sport of still water angling is like the difference between eating a large, rich, indulgent meal, and participating in a food contest.